The property at the corner of Crestwood and Seevers, known as “Ramona Gates”, was described as “A bright bit of lovely California transplanted to beautiful Beckley Club! A darling home of many wonders and thrills inside and out, Spanish effects galore. Decorated and built inside so Different, with a capital “D”. A genuine value”. An advertisement published in the Dallas Morning News on April 24, 1927 (Section VI, page 3), introduces yet another milestone in the Beckley Club development: Ramona Gates. The advertisement reads, “For the last year Beckley Club, the acknowledged most beautiful subdivision in the Southwest, has furnished the real estate sensations in Dallas. Creation after creation, innovation after innovation, and thrill after thrill have made folks expect the unique and different in this charm spot of Dallas. Prepare to feast your eyes on Beckley Club's crowning achievement in the home handling of unusual building style: “Ramona Gates” is a perfect, low, rambling Spanish "Hacienda" of seven practical rooms, an attractive corner lot with two freshly paved streets. From the picturesque patio, already planted to ornamental shrubs and flowering plants, with its raised bed of riotous color in the center, to the covered porch with its artistic arches plucked from the “Holy Walks” of California Missions and the genuine clay tile roof that should last for centuries, “Ramona Gates” pulls at your heartstrings! The entrance is guarded by a handsome wrought iron gate, while a companion but smaller gate leads out of the patio. These gates suggested the romantic name “Ramona Gates”, which will always be remembered by the people of Dallas as an exquisite showplace home. A few brief facts are all our space permits: more than 15,000 bricks used; genuine clay tile roof, charming Spanish patio with statue, studio window filling one end of living room, wrought iron gates, and grills galore; dining room two steps from living room, kitchen in colors, and all rooms filled with innovations in decoration. Completely furnished by Fred Kelly, the man who furnished “Coral Gables”. It is a dream! A home unique, a real showplace, but extremely sensible, practical, and comfortable". On the same page, an article titled "Ramona Gates Embodies Spanish Ideas", further describes the home, "The home is located on a prominent corner in the addition and overlooks some of the beautiful wooded sections. It is declared to be "perfect Spanish" in design and with its massive tapestry brick walls, clay tile roof, bricked-in patio with tile fountain and stature, and the elaborate use of wrought iron, suggest the spirit of Old Spain. Like the real hacienda of old, the simple, straight lines of the exterior lead up to a complete surprise when the luxuriant interior is beheld. Ramona Gates has been furnished and decorated in harmony with the correct Castilian inspiration. From the specially cast Mission Conception bronze knockers on each door, to the pea-green and white tile of the kitchen, every touch of the artist or artisan has meant an achievement in significant decoration. The furnishings are elaborate, yet done in conformity with good taste. 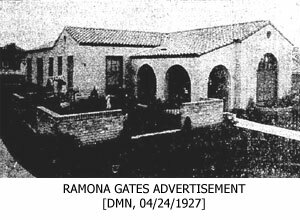 In Ramona Gates one may find, however, many of the modern innovations in building and furnishings which have made the Spanish type of home so popular in America".